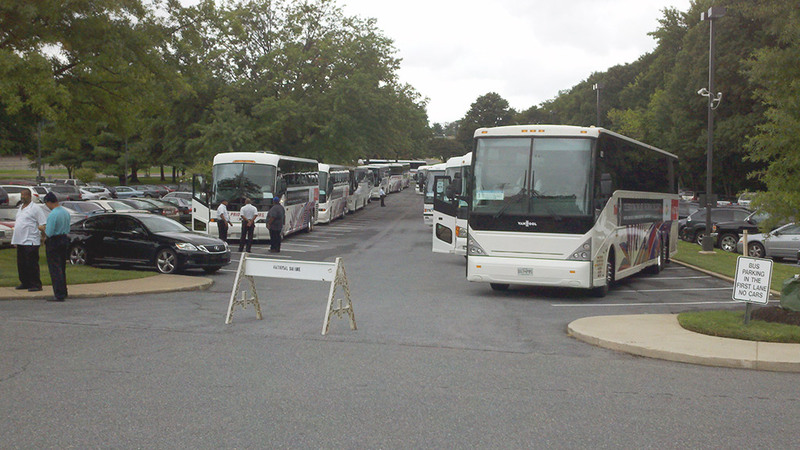 Large group ground transportation is a big part of the successful corporate or non-profit outing. After all, transportation is the first and last thing your attendees will encounter as they arrive and leave your special and carefully planned event. So, it’s important that you select the best from a legion of chartered bus companies. We’ve compiled a list of top tips that should help you make the special event transportation choice easy and worry free. If you follow the advice here, transportation will be the least of your concerns during the planning and execution of your event. 1. A good group transportation company should offer transportation management, not just bus service. Pre-empting hurdles such as road construction delays with up-to-the minute communication. These are all things which need happen behind the scenes well before your outing to keep your group happy and moving without schedule interruptions or long, dark walks to the buses. Great transportation management means more than moving people from “A” to “B”. 2. They should be big enough - yet flexible enough - to roll with your punches. It helps to work with a chosen group transportation service as early in the planning process as possible to reserve your transportation. But working early on means you need a company that can be flexible. There will likely be ongoing changes to the head count, possibly a need for ADA‑compliant vehicles or perhaps a last-minute addition to the itinerary. Even the best laid plans can rapidly change. So regardless of what you throw at them, the transportation management service should be big enough to accommodate your needs yet nimble enough to quickly change with you. The fleet should be large enough for last minute additions and staff should be accommodating to provide best-in-class service, even at the last minute. 3. The actual motor coach should add to the enjoyment for your guests. When it comes to the actual buses, ask about the age and condition of the buses, their maintenance records, and whether or not they are cleaned specifically for your group. Bus interiors shouldn’t be showing signs of wear, everything should be inspected daily and they shouldn’t look like you are the third group of people they moved that day. Finally, ask to see DOT safety records, keeping in mind that “satisfactory” is the highest rating that is given. Don’t settle for less. All three things should work together to give a feeling of safety and comfort, not to mention the qualifications and friendliness of the drivers. Additionally, ask if the company provides things such as additional signage or even bus wraps so your guests can easily spot their vehicles, on-board monitors to display a branded video during the ride, branded water or your choice of beverages. These are just a few of the little things a good charter bus company can offer to enhance ride enjoyment and your brand image. 4. Consider the price vs. quality and services. We all have budgets to work within but, like with many things, a low price isn’t necessarily an indicator of satisfaction. Remember that you’re not buying bread; you’re buying expertise and a reflection on you and your company. Be cautious when considering the lowest quote and ask for a detailed listing of all services. If it sounds too good to be true it probably is. If your brand and reputation are important, you’ll want to make sure the transportation management company services are in line with your expectations and requested needs. 5. Experience is proven in a group transportation company's reputation, references and the number of repeat clientele. There are reasons that the best of the best continually keep clients coming back. A special event transportation company that demonstrates longevity, has a long list of unsolicited testimonials or reviews and who can book the transportation needs of large companies or associations year after year, regardless of group size, must be doing something right. Check out charter bus company reviews and ask for a list of references. Then do your due diligence. Successful transportation for your guests takes an engrained culture of excellence and execution. It should be the end result of proper planning and pre-arranged coordination to make sure all of your needs and requests are met and your experience is beyond expectation. This is your goal as you select a group ground transportation service. If you think, like we do, that a transportation service should be all about you, your reputation and satisfaction talk to Callaway Transportation. Isn’t it time you went somewhere with the best?